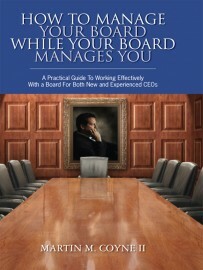 From Martin M. Coyne II-professional board director and senior advisor to CEOs and boards of directors-comes How to Manage Your Board While Your Board Manages You. In today’s complicated and high-stress corporate environment, there is unparalleled pressure on CEOs and their boards to rise above previous expectations and perform at sometimes soaring levels demanded by shareholders and, in many cases, Wall Street. When CEOs and board members become complacent in their commitment to a sustained and successful relationship, the corporation suffers. With the guidance laid out in Coyne’s pragmatic, hands-on style, CEOs, board members, and senior executives aspiring to become CEOs gain a richer understanding of the art of corporate governance, the strategies that maximize the efficacy of operating plans and business models, as well as a guide to successfully interfacing with key committees and the individuals comprising them.